With concerns escalating, North Korea should not lead us to tone down our voice and provide further concessions to Pyongyang and Tehran. We should in fact do the opposite. Iran’s nuclear program even without a bomb as we speak, enjoys the potential of becoming more dangerous than today’s North Korea after a recent hydrogen bomb testing – with new reports showing the blast delivering a far more powerful yield than presumed – and its increasing row with the international community. True is the fact that North Korea’s nuclear program is more advanced than that of Iran. True is the fact that Pyongyang has also provided ballistic missile hardware and technology to Tehran for decades now. Iran’s nuclear program, however, elevates to a higher level when we come to fully comprehend the nature of Tehran’s ambitions in pursuing objectives through treacherous measures. This is a regime that has yet to be punished for its malevolent actions throughout the past decades, and this needs to change. The clerics in Tehran rule a state fully acknowledging the fact that its very survival hinges on the ability to literally adopt an aggressive approach that is germane to causing mayhem abroad. Taking advantage of the Iran-Iraq War of the 1980s, launching terrorist attacks and assassinations throughout the 90s, and in the new millennium enjoying the devastating 9/11 aftermath in the wars of Afghanistan and Iraq, leading onto Syria and Yemen today. While there is no intention to justify North Korea obtaining nuclear weapons, it is crystal clear that Pyongyang has gone the limits in procuring its nuclear arsenal for defensive purposes and to be legitimately recognized and respect. Iran’s regime, however, has far more hostile goals in its crosshairs. As the Islamic State terror group is being defeated in Iraq and Syria, an increasing concern is focused on Tehran’s intention of establishing a land-bridge to the Mediterranean. This would provide Iran the capability to send boots, arms, finances and other necessities for its proxy forces checkered across these lands to establish a long-lasting foothold. Coupling a nuclear arsenal with Iran’s other assets escalates the threat even further. Iran is sitting on a sea of oil, possessing the world’s fourth largest crude oil reserves. If that were not enough, Iran also enjoys the luxury of owning the world’s second largest natural gas reserves. North Korea lacks any such natural resources. Again, this does not legitimize in any way Pyongyang’s pursuit of nuclear weapons, especially how its population continues to struggle with poverty and starvation. Speaking of people, Iran’s over 80 million is the second largest population in the region, providing it with a very large and capable workforce. Whereas North Korea has a population of 25.4 million and is forced to send tens of thousands of workers abroad to send money back home for their careworn families. Another very distinct difference between the two states is the fact that Iran is significantly religious, taking advantage and provoking sectarian strife in the Middle East. Iran becoming a nuclear power will elevate the stakes in this flashpoint region and most certainly launch a nuclear arms race of disastrous prospects. North Korea, however, is surrounded by South Korea and Japan, two major US allies, and tens of thousands US boots stationed in various bases and ships. China, most likely North Korea’s only key ally, and Russia most certainly will not side by Pyongyang in the case of a substantial conflict with the international community. This has been proven as the United Nations Security Council on Monday slapped the harshest sanctions to date on North Korea, capping fuel deliveries and banning all its profitable textile exports. Pyongyang understands very well it can quite easily lose the support of Beijing, especially with new threats from Washington, and Moscow is no party to count on. Reports indicate the Trump administration is busy weighing a more aggressive strategy on Iran. This should include inspecting the regime’s military sites, especially after a senior advisor of Iranian Supreme Leader Ali Khamenei rejected any such measures by the UN nuclear watchdog, the International Atomic Energy Agency (IAEA). There will most definitely be a chorus of warnings by Iran apologists claiming such a stance will only render negative results. Unfortunately, as a result of such lobbying, the West and the international community as a whole has to this day embraced engagement with Iran, refraining to take necessary actions. Furthermore, this is not a call for another unnecessary war in the Middle East, as many Iran apologists would quickly paint it so. Launching rigorous inspections of Iran’s military sites, beginning with the controversial Parchin complex, located southeast of Tehran, to resolve outstanding questions over “possible military dimension” issues. Adopting a UN Security Council resolution demanding Iran halt all ballistic missile tests, through which Tehran seeks perfecting this know-how to deliver nuclear payloads. Taking action to end Iran’s support for terrorism; meddling in Syria, Iraq, Yemen, Lebanon and other countries; and this regime’s ignoble history of human rights violations at home. Adopting sanctions targeting Iran’s belligerence across the region. The House of Representatives has taken a step in the right direction by voting in favor of measures aimed at blocking commercial aircraft sales to Iran. The US Treasury Department also imposed new sanctions on 11 firms and individuals involved in Tehran’s ballistic missile program, cyberattacks and support for terrorism. The world currently faces two atomic crises in Iran and North Korea, despite long strides in the effort of nuclear non-proliferation. Deep military and nuclear cooperation between the two states makes dealing with these challenges even more difficult. One may have thought lessons would have been learnt from the devastating lessons of appeasement from World War II – yet the approaches adopted vis-à-vis North Korea and Iran in signing nuclear agreements have raised accusations that Neville Chamberlain’s famous policy is still alive and well. It’s obvious that Iran has learned from North Korea, and vice-versa, in both military and diplomatic spheres: in a recent Raddington Report article we argue that there are few nations that view North Korean missile tests with more interest than Iran. The Islamic Republic yearns to be in the position North Korea finds itself in – to have developed a nuclear arsenal, along with the means of deliver the payload. And North Korea covets to have had the opportunity Iran found: usurping Obama’s desperate need for a legacy-defining foreign policy achievement to garner a slate of concessions. There is seemingly little appetite for a military confrontation with North Korea or Iran – yet the appeasement of these two rogue regimes have left the international community in more of a quagmire. North Korea is holding South Korea and Japan hostage (along with tens of thousands of stationed US troops) while Iran continues its regional meddling, support for terrorism, ballistic missile advances and human rights violations, all whilst reaching an agreement with the P5+1. Pyongyang and Tehran have both sought nuclear weapons as insurance for their notorious regimes. Enjoying enticement by US administrations since the 1990s, North Korea has reached its objective, at the expense of it’s starving people – and economy more broadly. Iran, whilst seeking nuclear capability, began feeling the heat of international sanctions and escalating public anger, which forced it to trade a curbing of its nuclear program in return for sanctions relief. What goes unnoticed, however, is how agreements signed by the international community with these two regimes provide a green light to the ruling autocrats to pursue the oppression of their own populations. Iran has continued its practice of abducting American citizens and sentencing them to long prison terms. A situation in which Kim Jung Un was provided more inducements to come to the negotiating table – as in Iran’s case – could possibly result in further abductions, assassinations and more tens of thousands of political prisoners held in facilities so large they are visible in satellite images. Concessions have already provided Iran a green light to expand its domestic crackdown and meddling abroad. The definition of insanity, famously, is doing the same thing over and over again, but expecting different results. Offering a possible insight into the Trump administration’s future approach to Iran, known as the Joint Comprehensive Plan of Action (JCPOA), Nikki Haley delivered a speech recently in the American Enterprise Institute, stating that; “…if the President does not certify Iranian compliance, the Corker-Cardin law also tells us what happens next. What happens next is significantly in Congress’s hands,” she explained, in reference to the Iran Nuclear Agreement Review Act. “Congress could debate whether the nuclear deal is in fact too big to fail. We should welcome a debate over whether the JCPOA is in U.S. national security interests. The previous administration set up the deal in a way that denied us that honest and serious debate,” the US Ambassador to the United Nations continued. Following Pyongyang’s latest nuclear test, which led to claims that the DPRK has acquired the ability to test a hydrogen bomb, there is belief amongst high circles in Washington that North Korea is supporting Iran in return to the path of obtaining nuclear weapons. While Washington is weighing its options in responding to North Korea’s latest nuclear bomb test, most concerning are obvious shows of allegiance, such as a recent 10-day visit to Tehran by Pyongyang’s parliament speaker Kim Yong Nam. Thanks to a ‘windfall’ of billions of dollars provided by the Obama-blueprinted nuclear deal, Iran has the hard currency and financial assets North Korea needs. In return, Pyongyang can deliver the nuclear weapons and ballistic missile technology Tehran wants to acquire. It has become increasingly obvious these regimes are far from rational actors who can be persuaded into taking action for the better benefit of the international community. North Korea must be made to bow before demands to give up nuclear weapons, whilst Iran must be made to understand that following the path of its East Asian partner is not an option. The response Tehran receives from the international community, with the US at the helm, is of vital importance. The failure of previous US administrations to take any meaningful action to prevent the growth of such a dangerous nexus leaves us with the circumstances we face today. It is a known fact that many of Tehran’s ballistic missile designs, such as the Hwasong series, are based on Pyongyang prototypes. This is the result of political and military ties leading back to the Iran-Iraq War of the 1980s. Concerns escalate to a highly lethal level when we realize Iran’s missiles, mirroring those of its North Korean sisters, could enjoy the capability of delivering nuclear payloads. These decades-long close exchanges have now also provided Iran the ability to construct missile production factories in Syria and Libya, some underground. It is increasingly difficult to deny Tehran’s diplomatic, economic and military ties with Pyongyang. It is even possible the two country’s scientists have been present at each other’s nuclear and ballistic missile tests, one after another. Tehran and Pyongyang must be made to comprehend that a continuation of their provocations cannot not be tolerated – senior Iranian and North Korean leaders, along with the institutions maintaining their rule, should be the target of crippling international sanctions. Kim, Khamenei and their henchmen, must find it far more difficult to plunder their people’s wealth for their own interests, while the two populations suffer in poverty. The international community should also boost campaigns aimed at drying up the two regimes’ supply chains providing the needs for their missile and nuclear drives. This question is now raised over the meaning of seeking a new nuclear arrangement with North Korea, especially as the JCPOA is currently being usurped by Iran. Surely rapprochement will only encourage Pyongyang to continue its current aggressive nature – and what lessons would Tehran, a regime enjoying a dangerous reach across the Middle East, learn from this? There is no need to explain how Tehran and Pyongyang have most likely followed each other’s negotiations with the international community, the deals sealed to buy time, the successful and unsuccessful lies and deceptions and how to come to each other’s support when needed. Most importantly, however, they have learned how to create rifts amongst Western countries, such as the United States, France and Britain, and to utilise Russian and Chinese postures, to divide in the UN Security Council. As Haley correctly said, “Enough is enough.” War is neither needed nor welcomed. An international consensus to impose crippling sanctions on the regimes of Iran and North Korea is necessary. Although watered down to garner the support of Beijing and Moscow, the sanctions adopted unanimously by the United Nations Security Council on Monday against North Korea, capping the regime’s oil imports from China and banning its profitable textile exports, is a step in the right direction. One hopes this is the beginning of a continuing trend to bring an end to Pyongyang’s dangerous bellicosities, and sends a powerful message to Tehran of the international community’s resolve and intolerance for such rogue behavior. If history is to teach us any lesson, it is that of rapprochement rendering nothing but death and destruction. If we seek an end to the current nuclear standoffs, all parties must further set aside their short term interests and think for the better good of all. As ISIS is losing ground in its two last enclaves of Raqqa and Deir el-Zor, there are many rightfully concerning reports of Iran seeking to chip further control in Syria. All the while, there are also signs of contradictory remarks heard from senior Iranian officials, parallel to indications on the ground of how international counterparts are seeking their own interests that fall completely against those of Tehran’s. 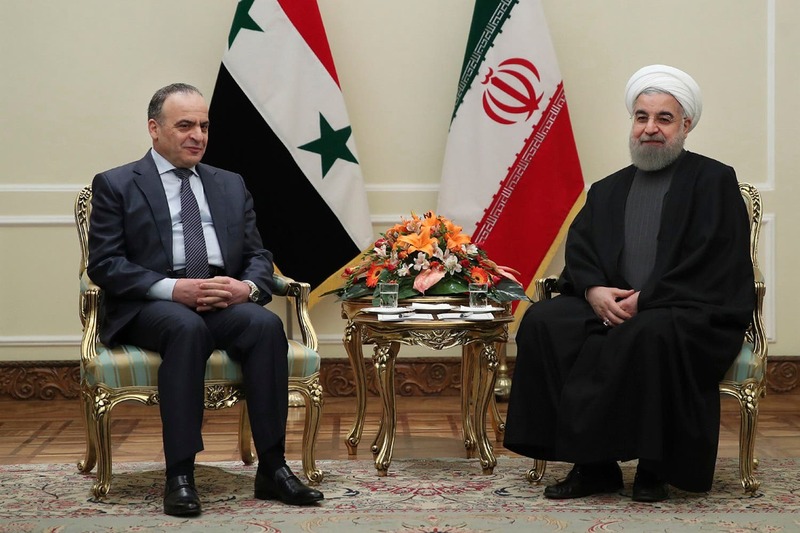 Such incoherency signals nothing but troubling times ahead for Iran in losing its grasp of strategic interests across the Middle East, including Syria. Similar sentiments were heard recently from Iranian Foreign Minister Mohammad Javad Zarif and Revolutionary Guards (IRGC) Quds Force commander Qassem Suleimani. Zarif exerted himself to defend Tehran’s carnage in other countries under the pretext of a mandate to defend human rights. “The foreign policy of the Islamic Republic, based on the constitution, is a policy that is naturally founded on human rights. What is the meaning of human rights? It means defending the rights of innocent against oppressors… We have this definition in our constitution. This is not tantamount to meddling,” he claimed. Zarif’s remarks were followed by Suleimani’s insight. “There were friends in high places, in our country’s domestic and foreign hierarchy, who argued not to get involved in Syria and Iraq, and sit back and respectfully defend the revolution. One individual asked you mean we go and defend dictators? The leader (referring to Iranian Supreme Leader Ali Khamenei) provided a clear response in saying when you look at the countries we have relations with, who is a dictator and who is not? We simply look at our interests,” he explained. The relations Khamenei refers to promote an image into the very nature of his establishment. Bashar Al-Assad’s dictatorship in Syria can be read as a reign of death and destruction. With Iran’s support and in the absence of a coordinated global response over 500,000 have been killed, scores more injured, over 12 million are internally displaced or forced to seek refuge abroad, and swathes of the country is left in ruins. Iraq’s former prime minister Nouri Al-Maliki, another figure described as Tehran’s puppet, has a similar report card unfortunately gone neglected. The Sunni community was the main target of Al-Maliki’s Iran-backed wrath, fueling the rise of ISIS. In Yemen the Houthis and ousted dictator Ali Abdullah Salah have also been at the receiving end of Iran’s support. As the Saudi-led coalition advances against Iran’s disastrous efforts, signs of major rifts, and even reports of clashes between the two forces, constitute a major quagmire for Tehran. The Lebanese Hezbollah, Iran’s proxy offspring brought to life by the IRGC back in the early 1980s, are known to instigate the Syrian war by supporting Al-Assad, and pursuing Tehran’s interest wherever needed across the Middle East. Looking abroad, Iran has established cozy relations with North Korea and Venezuela, both dictators whose people are starving. The Pyongyang-Tehran axis is especially raising concerns considering their close nuclear and ballistic missile collaboration. This is a regime provoking a variety of bellicosities. Recent threats by Iranian President Hassan Rouhani and Atomic Energy Organization chief Ali Akbar Salehi of relaunching certain nuclear activities are reminders of the dangers of Iran acquiring nuclear weapons. Extending equally to such concerns, and not receiving adequate consideration, is Iran’s ongoing human rights violations. Over 100 executions were reported in the month of July alone. This comes after more than 3,000 were sent to the gallows during Rouhani’s first term. More recent cases include the ongoing hunger strike of dozens of political prisoners in a jail west of Tehran going on for nearly four weeks now. These inmates are protesting prison guards resorting to violence and other repressive measures used to impose further pressures. While this and many other such cases deserve an international inquiry, they do signal a significant change in tone of courage in Iran’s powder keg society against the ruling regime. Fortunately, there is an end to be seen in the Syrian war. However, six years after the spark of that revolution, the Syrian people have suffered tremendously mainly due to Obama’s compelling kowtowing to Iran. The war has been draining Iran, forcing it to seek the support of other parties, including Russia. The more parties with stakes in Syria, and with the US taking a far more active stance, the more Iran sees its future in the country threatened. As the Levant’s forthcoming is being blueprinted, high on the agenda must be thwarting Iran’s interests. With ISIS defeated in Iraq, there will be no legitimacy for Iran’s presence in Iraq in any shape or form. The same argument goes for Syria. The international community, coming to realize Iran’s destructive nature, should take the initiative and demand the eviction of all Iranian elements from Syria, including IRGC members and foreign proxy members transferred from abroad. All said and done, comprehending Iran’s regime thrives on the mentality of spreading crises across the region is vital. Ceasefire and reconciliation are not in this regime’s nature, knowing increasing public demands will follow. This regime has failed to provide in elementary needs inside Iran for the past four decades. Thus, satellite states abroad will be no exception. Peace and tranquility in the Middle East hinges on containing Iran’s influence from all its neighboring countries and a complete end to its lethal meddling. A new chapter is being written in this flashpoint region’s history.